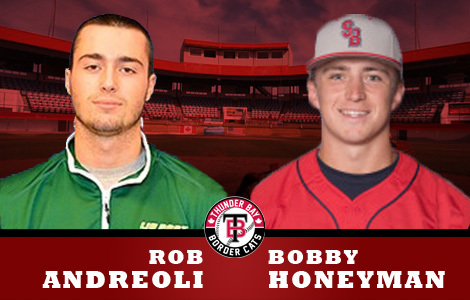 The Thunder Bay Border Cats have added two more from New York to their 2016 roster. Bobby Honeyman (Stony Brook) is having a productive second season with the Stony Brook Seawolves with a .247 batting average and a .987 fielding percentage. Honeyman has started all 22 of the Seawolves games so far in the season, putting up 13 runs on 18 hits and 9 RBI. The New York born infielder was named to the America East Conference All-Rookie team last year after putting up a .257 batting average and notching 38 hits, 21 RBI and eight multi-hit games in his first season at Stony Brook. Rob Andreoli (LIU Post) will be headed to Thunder Bay from Long Island University. The sophomore outfielder has started the Pioneers season off strong with a .329 batting average picking up 27 hits and 15 runs with 16 RBI. They New York native also has a 1.00 fielding percentage. Before college Andreoli played two varsity seasons at MacArthur High School and was named All-Conference in 2013 and All-County in 2014. The Border Cats are a member of the finest developmental league for elite college baseball players, the Northwoods League. Playing its 23rd season of summer collegiate baseball in 2016, the Northwoods League is the largest organized baseball league in the world with 18 teams, drawing significantly more fans, in a friendly ballpark experience, than any league of its kind. A valuable training ground for coaches, umpires and front office staff, more than 140 Northwoods League players have advanced to Major League Baseball, including Cy Young Award winner Max Scherzer (WAS) and MLB All-Stars Chris Sale (CWS),Jordan Zimmermann (DET), Curtis Granderson (NYM), Lucas Duda (NYM) and Ben Zobrist (CHC). All league games are viewable live via the Northwoods League Website.